Declan Devine’s Club Northern Ireland side made an instant impact in the Junior Section of the SuperCupNI, defeating County Fermanagh 3-0 at Anderson Park on Monday. Club NI, an Irish FA Academy side, are an under 14 team playing in an under 15 competition. The former Derry City boss said, “It was a fantastic win when you consider these kids are all a year younger than the players they are playing against. “The pleasing thing for me is that they kept a clean sheet and they played a bit - but there is more to come from this group. “It’s a big step to play a year long at this age, and to have all your players doing that at that age group is difficult because physicality can take over the game. “But I thought our lads were terrific. They scored three really good goals and the movement was good. “It’s really early stages at the but these boys, under the direction of Jim Magilton have travelled all over the world, playing against the likes of Atletico Madrid, PSG, top European clubs. Sean McAllister’s low strike gave ClubNI the lead just before half-time before substitute Matthew Lusty scored two second half goals. Lusty’s glancing header was the pick of the bunch from the Coleraine venue. Another county side who suffered defeat was Londonderry, who lost 2-0 to Mexican side Chivas at Scroggy Road in Limavady. David Bryson’s Down also suffered a defeat. SuperCup regulars Cherry Orchard won 2-0 in Portrush, with two goals from Kyle Cosgrove. Tyrone followed in the footsteps of Derry and Down and lost 2-0. English club Plymouth Argyle ran out comfortable winners in Limavady. 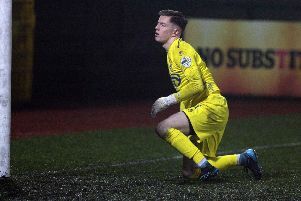 The county side who produced the best performance at Junior level was Stefan Seaton’s Antrim, who held Premier League Academy side Southampton to a 1-1 at the Riada Stadium in Ballymoney. At the Coleraine Showgrounds, County Armagh drew 1-1 with Rangers. Manchester United marked their return to competitive action in the SuperCupNI with a 3-0 win over Chilean side Colina at Seahaven in Portstewart. Teden Mengi scored twice for the young Red Devils, with Anthony Elanga also finding the net. The match was brought to a premature close, some seven minutes from time, after a fan took ill. Both teams agreed to end the game early, to give medics easier access to the stricken spectator.